Summer would just not be complete without a good old fashioned family camping and fishing trip and if that trip involved horses all the better. Who doesn’t remember cooking smores over a campfire or staying up late looking at the stars? The stars are always much more clear far away from the city lights. Or roasting hot dogs and telling ghost stories around a campfire with good friends and family. If you remember those times maybe it is time to create new memories with your family or friends. Come join us on a High Uinta backcountry horseback adventure and see the natural treasure that lies “in your own backyard” in Northeastern Utah’s Ashley National forest. See wildlife, fish high mountain lakes, hike rugged peaks or just lie around and enjoy the sights, sounds and smells of Mother Nature. Take a horse ride with our experienced wranglers “just over the next hill” or walk around the nearest lake and actually see fish along the shoreline. Most of the high mountain lakes in the High Uinta’s are stocked and fishable with best results being observed with a fly, but worm dunking and simply casting a lure will often times “net” great results as well! 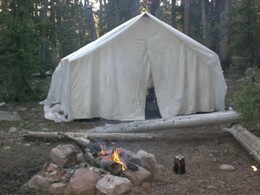 Some come join us in the High Uinta wilderness for a horseback camping and fishing adventure sure to please the whole family. Your adventure will begin at the trailhead at moonlake with your guide/wrangler sorting and packing your gear for your backcountry horseback adventure. Or maybe you will want to try one of Utah’s high uinta treasured draingaes like Swift Creek, or Yellowstone of even Rock creek. After getting your gear packed, loaded and secured with a diamond hitch on a mountain worthy mule or horse you will be instructed in the basics of horseback riding in the High uinta’s. Then you will saddle off and head into the high country to create new or recreate old camping and fishing memories with those you have chosen to invest your time with. Now is the time to relax, shut out the worries of the world, forget you own a cel phone (you can’t get coverage anyway), laptop or smart phone and just listen to the sound of the horses hooves on the trail or make fun conversation with your guide, friends or family you brought along on this summer adventure. Once you arrive at your predetermined spot, what you do from here is completely up to you. If a drop camp, you may want to get to work setting your camp and saying good bye to your wrangler and leaving him or her with specific instructions as to when to pick you up. If you are on one of our catered camps, then it is your responsibility to just enjoy your time in the backcountry while your guide goes about arranging your meals, camp and dealing with the horses and mules. We offer some of the best Utah fly fishing available. Experience high altitude lake fishing in the beautiful Uinta Mountains of North Eastern Utah. The Uinta Mountains are unique because they run east and west as opposed to most mountain ranges that run north and south. The highest peek in Utah, Kings Peek, is in this mountain range. 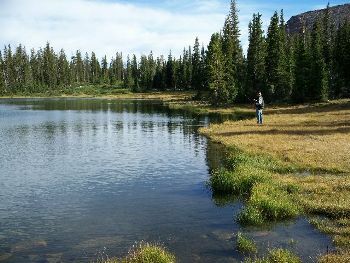 These high fishing lakes sit anywhere from 9,000 - 12,000 feet in elevation and are in beautiful mountain surroundings. These wilderness Horseback trips are accessible by horseback only and are very popular because of the extremely good fly fishing. Our Utah fly fishing guides will bring you to the best spots. These fishing and sightseeing Horseback trips provide our clients with a chance for world class wild fish including Brookies, Cutthroats, Rainbows, and Browns. Come see our majestic mountain peaks and pristine lakes in the Uinta Mountains. We can provide a completely catered trip for your adventure or just pack in you and your gear as a drop camp. Once you decide how you want to do your Uinta fly fishing and sight seeing trip be sure and contact us to secure your dates.